The vision of the GreenLight project is to utilise lignin, a wood component that is a large by-product from pulp mills, as raw material for green and cost-efficient carbon fibres. Biobased cost-efficient carbon fibres would enable an increased replacement of steel with carbon fibre composites in cars. This would in turn decrease the weight and fuel/electricity consumption of the car fleet. Lignin-based carbon fibres have so far only been produced in small laboratory scale. The great challenges for the GreenLight team are to achieve good enough carbon fibre strength and to upscale the involved processes to pilot scale. The initiative is of great significance in terms of access to bio-based products in a future bioeconomy. GreenLight runs July 2015 – June 2019 and has nine partners from four countries: Sweden, Italy, United Kingdom and Germany. The overall objectives of the project are to demonstrate a new biobased, renewable and economically viable carbon fibre precursor – lignin – and to develop conditions for its processing into carbon fibre and structural carbon fibre composites. The target is a cost-effective biobased carbon fibre for use in reinforced composites delivering enough strength properties for large volume automotive applications. Reducing vehicle weight is a decisive factor for successful fulfilment of the future targets in regulations regarding CO2 emissions from the automotive sector. Carbon fibre reinforced plastics has been introduced as a low-weight material replacing and complementing steel and aluminium. Today’s carbon fibre production is based on a petroleum-based raw material, PAN, which is costly due to the starting precursor and the process for turning it into carbon fibre. The automotive sector has identified a need for a cheaper lower-grade carbon fibre to meet the demands of components in normal consumer cars. 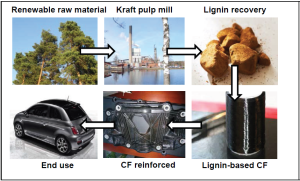 Lignin from kraft pulp mills is a green, sustainable, abundant and cost-efficient new potential carbon fibre precursor. The development of lignin-based carbon fibre is still in laboratory scale and material properties meeting high-quality product demands is the main challenge. The LignoBoost technology that has recently been introduced in commercial operation makes it possible to produce lignin with new properties, higher purity and with less impact on the pulp mill operation. With this as a basis, GreenLight tailors kraft lignin properties already in the lignin separation and upgrading and optimises the lignin for target automotive applications. GreenLight has demonstrated the continuous multifilament spinning (about 100 filaments) of 100% softwood lignin into high quality and low diameter filaments. The tensile properties of fibres are the highest reported for melt-spun pure lignin-based carbon fibres. The conversion process can be done at a relatively fast speed compared to what has been reported for lignin-based carbon fibres. Based on the mechanical and surface properties of the fibres, lignin-based carbon fibres could have a potential application in manufacturing short fibre composites which have lower production cost and broad applications. A new spinning process for lignin has been developed, which allows continuous spinning and winding with automatic spool change. Application for a patent is in progress. If cheap, climate friendly and sufficiently strong carbon fibre can be manufactured from lignin, new market segments could be opened for the carbon fibre industry and, thereby, for the pulp industry. GreenLight´s techno-economic assessment indicates that the price of lignin-based carbon fibre may become lower than for conventional PAN-based carbon fibre. A preliminary life-cycle assessment shows a lower global warming potential for the GreenLight carbon fibre than for glass fibre.